We go from a game that debuted on the Wii and received a port on the Switch, to a game that originated on the Wii U and got ported to the Switch as well. It's Captain Toad: Treasure Tracker, and as I didn't want to shell out money for both the Switch and 3DS versions of the game, I'm reviewing the Nintendo Switch build exclusively. Once again, dear friends, we've come to a Nintendo Switch game that already saw its debut on the Wii U, Nintendo's ill-fated console. While it's no wonder why Nintendo wishes to get its Wii U software out to more players by putting it on the Switch, in many cases, the additions (or lack thereof) don't really justify double-dipping. (Unless you're a sucker for playing games on the Switch like me, of course.) 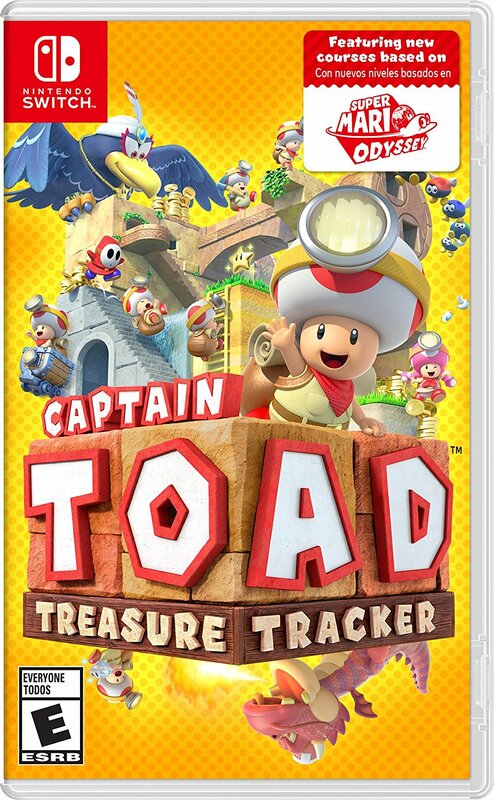 Captain Toad: Treasure Tracker is the latest Wii U game to get a Switch port, and with it comes a new co-op mode and a quartet of levels based off of Super Mario Odyssey. For those who have already played the Wii U original, do these new additions make the case for double-dipping on the Captain's adventure? Captain Toad: Treasure Tracker plays out in a miniature diorama-like levels, which can be completed in less than five minutes each. In these levels, the objective is to reach the Power Star located in every level, usually involving interaction with the environment, avoiding enemies, and figuring out how to maneuver through the stage to progress. For instance, you'll spin wheels to turn platforms to make a way for Captain Toad to get across, and you'll touch special platforms to slide them around. Unlike Mario, Captain Toad does not have any "super" jumping ability to him. Instead, he needs to climb hills, ladders, ride in pipes, and scale other height-bestowing objects in order to reach higher locations in levels. He can then drop down to new parts of levels, which is a mechanic that is used generously in Treasure Tracker. Captain Toad also doesn't have much bark to his bite. In fact, he doesn't really have either! I mean, look at that cute face, how could he possibly have any anger behind that!? Regardless, what I'm referring to here is that Captain Toad cannot directly attack enemies. His method of dispatching foes is plucking and picking up turnips and proceeding to chuck them at enemies in his way. Sometimes pluck-able spots will house coins, Mushrooms, or other items inside them as a bonus instead of a turnip. 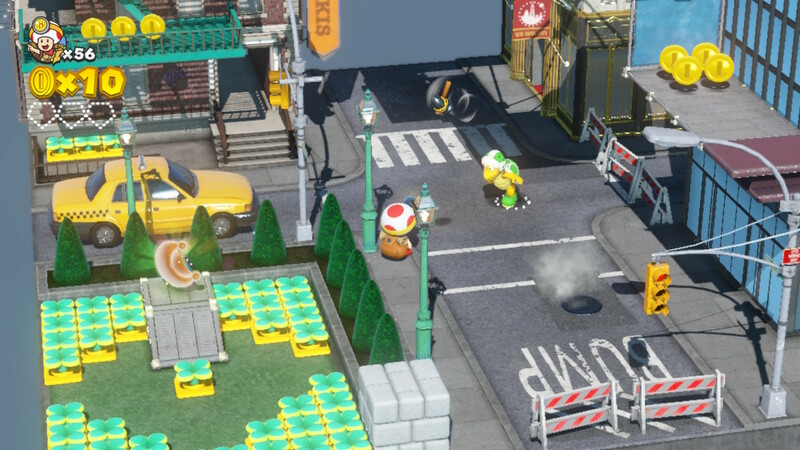 The Mushroom is used in traditional Super Mario fashion, having Captain Toad restore himself to full health if he has taken damage. Let this be a lesson to Captain Toad: Never trespass on Shy Guy territory. There are over 70 stages within Captain Toad: Treasure Tracker, 65 of which are in the main story, which actually brings one other playable character into the mix outside of Captain Toad. These stages run the gamut from flower gardens, raging locomotives, mine cart rides down mountains, desert ruins, fiery volcanoes, beach-side excursions, snazzy pachinko boards, Wild West towns, and even some boss stages to enjoy. The levels after the main game consist of retreads through past stages where you must gather and carefully transport the Toad Brigade to a Power Star, as well as other stages where you must avoid a shadowy, dangerous doppelganger who follows your every movement. Not the most inviting forest around, but the treasure's ready for the taking all the same! Each stage has three diamonds to collect, and these are at many times hidden well. It wasn't uncommon for me to have to return to a previous stage just to track down a diamond that I was so unobservant that I missed on my first run. The diamonds in Treasure Tracker don't necessarily require you to nab them all, but you can find your progress gated by levels that require a specific amount of diamonds to unlock. However, they're so much to collect, offering rewarding exploration from doing so, that would be a shame to miss out on them. Ah, coins, diamonds, and Power Stars... a treasure tracker's delight! In addition to diamonds, each level has its own secondary objective apart from collecting the Power Star to achieve. Unlike many of the diamonds in Treasure Tracker, these objectives are completely optional, simply bringing more replay value to players who wish to complete them. These can range from finding and collecting 150 coins in a level, to discovering the location of a Golden or 1-Up Mushroom, to beating a level without being detected by a Shy Guy, and to defeating all enemies within a given stage. I found myself loving going after these objectives, as many times they made me play levels in far different ways than I initially approached them. On a lot of occasions, these secondary objectives highlighted the spectacular level design displayed in Captain Toad: Treasure Tracker. This particular stage's secondary objective is to hit as few P-buttons as possible. Originally in the Wii U version, free DLC made it so you could use a Toad amiibo on the Wii U GamePad and play a hide-and-seek game with Pixel Toad in each and every level. 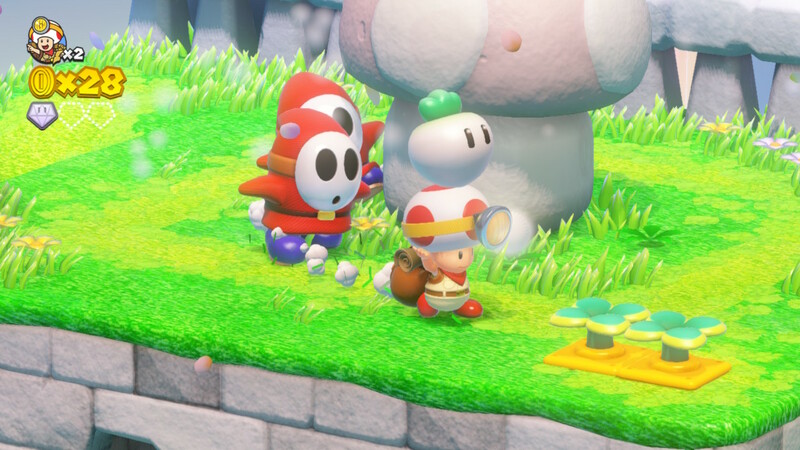 Instead of requiring a costly amiibo this time around, the Nintendo Switch version of Captain Toad: Treasure Tracker already includes these Pixel Toad hunts immediately. All you have to do is beat a stage once to unlock the Pixel Toad hunt in that level. These hunts have you navigating the levels like you'd ordinarily do, but instead of reaching a Power Star, your goal is to find and "click" on the Pixel Toad hiding somewhere in the level, usually on an out-of-the-way wall or floor somewhere that takes some work getting to. 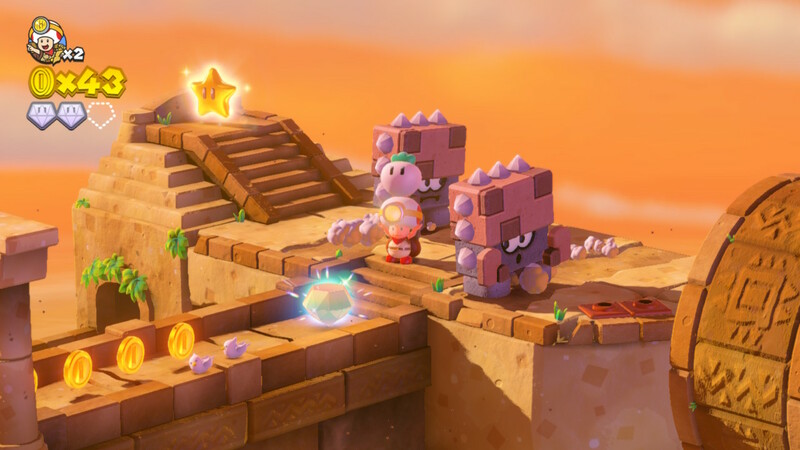 Speaking of clicking, touching, and interacting with aspects of the environment, Captain Toad: Treasure Tracker on the Switch features some curious control additions. For one, when playing in docked mode, a cursor is always planted firmly on the screen. You use it to click on items in the environment that can be interacted with. Meanwhile, when in handheld mode, you can use the touch screen as always to move platforms and the like, but it's also how you spin wheels, too. The problem here is that when running across a wheel that you can spin, the transparent graphic for spinning the wheel pops up right in the center of the screen, taking up lots of screen space. It also stops Captain Toad right in his tracks. This can result in running from an enemy only to stop to a dead halt when you cross the wheel spinner, thus taking damage. I question why the option to confirm you want to use a contraption wasn't included instead of it just occurring automatically. It's quite a vexing oversight. What are YOU looking at, fire-breath!? In the more pleasing department, the Switch version comes with two exclusive features compared to its Wii U original: a cooperative two-player mode and a handful of Super Mario Odyssey-themed levels. The cooperative multiplayer isn't as spectacular as having two Toads explore and meander around levels together, but instead it's meant to be shared with a more casual player of video games. 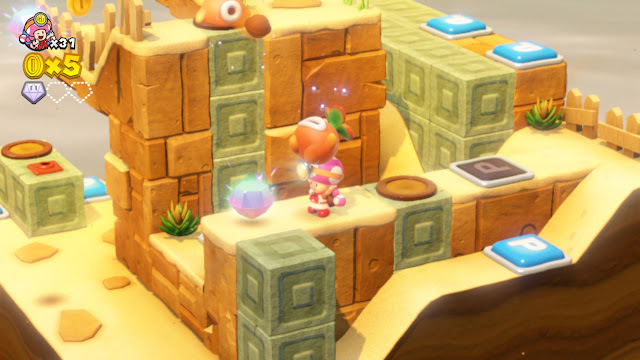 The second player can poke and prod both enemies and the environment, as well as situate the camera for the player controlling Captain Toad. This, of course, requires some excellent teamwork and communication skills in order to keep Toad from meeting an untimely end. 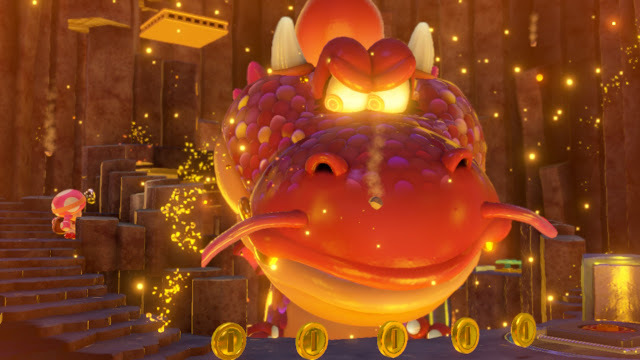 Meanwhile, replacing the Super Mario 3D World bonus levels of the Wii U game (which is a positive thing, as those levels weren't a good fit for the original game due to being directly carried over from 3D World) are brand-new Super Mario Odyssey levels based in Fossil Falls, Tostarena, New Donk City, and Mount Volbone. 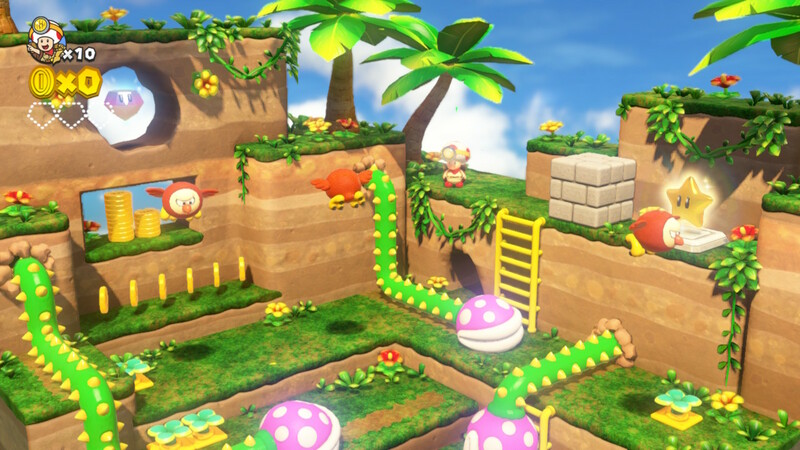 The middle two levels are full-fledged exploration and puzzle-based affairs, while Fossil Falls is a mine cart level and Mount Volbone is a race sequence. There is pleasant variety, but completing these levels 100% with all diamonds and bonus objectives completed doesn't take very long. Looks like we have some afternoon congestion with a mad Hammer Bro blocking the intersection. If you're holding out hope that the Nintendo Switch version of Captain Toad: Treasure Tracker is worth picking up if you've already exhausted the Wii U game, then I have some unfortunate news for you--it's really not. Well, I add a caveat to that, and that is unless you're like me and enjoyed the original so much that you just want an excuse to experience the game all over again on a system that works without needing a giant, unreliable Wii U GamePad. Otherwise, if you don't mind sticking with the Wii U and/or have no desire to buy what amounts to the same game again for full MSRP, then you're better off saving your hard-earned money. That said, for those that have never played the game before, this puzzle-platformer is simply put (and get ready to groan), a "treasure" you need to play.